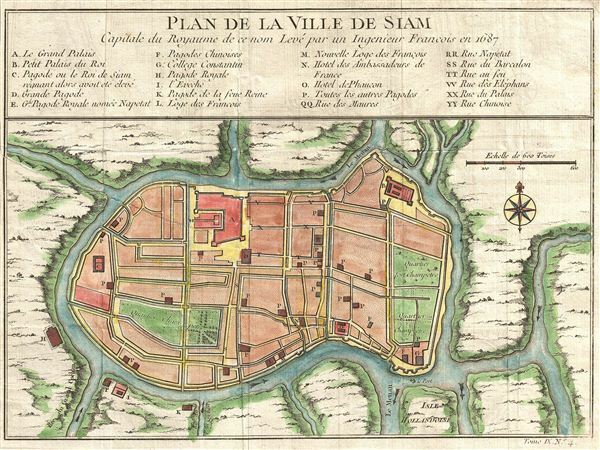 Plan de la Ville De Siam. A beautifully hand-colored, copper engraving from the mid-1700s of the former Thai royal capital Ayutthaya (known to europeans as the 'Ville de Siam'). At the time this map was made, Ayutthaya was one of the most prosperous cities in east Asia, and possibly the largest city in the world, with close to 1 million inhabitants. Trade flourished with the Dutch, French, Chinese and Japanese, with influence spanning from the Malay Peninsula, the Andaman ports of present day Myanmar, the Angkor kingdom of Cambodia, to northern Thailand. Ayutthaya's power declined in the 1700s due to infighting among princes and officials. The powerful Kingdom of Burma (Myanmar) began a war with the Thai's of Ayutthaya in the 1750s, and in 1767 broke through the walls, sacked the city and burned it to the ground. The royal family fled, its king dying of starvation in hiding just ten days later. Two years later, the Thai commander, General Taksin, would reunite the Thai kingdom, vanquish the Burmese, and establish a new seat of power to the south: Bangkok. Drawn by Jacques Nicolas Bellin and published as plate no. 4 in volume 9 of the 1752 French edition of Abbe Provost's L'Histoire Generale des Voyages. Provost, A., L`Histoire Generale des Voyages, Vol. IX, plate 4.